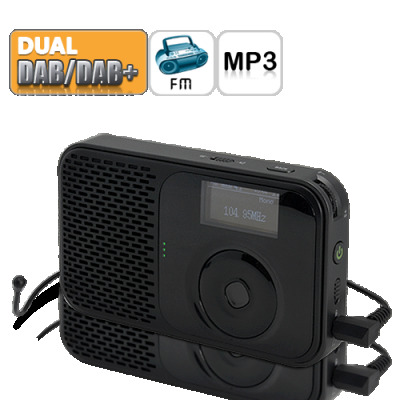 Successfully Added Pocket Digital Radio with Audio Recording (MP3, FM Radio, DAB/DAB+) to your Shopping Cart. Tune in to the world on the go with this Pocket Digital Radio with Audio Recording. Featuring both FM radio and DAB/DAB+ broadcasts, this digital radio is your portal for listening to the world. DAB+: DAB+ is the updated version of the DAB standard and used in Europe, Canada, China, Australia, and many more places. This new standard is approximately twice as efficient as DAB due to the adoption of the AAC+ audio codec, which leads to much better sound at a lower bit rate. FM Radio: The older FM radio system is still popular and used throughout the world. Just press a few buttons and tune in to the local stations to see what they have to offer. MP3 Player: Connect this Pocket Digital Radio to your computer via USB and upload songs directly! You can also keep songs inside a micro SD card and the built-in MP3 player will play it flawlessly. Besides looking great and being so easy to use, this Pocket Digital Radio gives you four different sources to receive radio broadcasts from, so take it with you anywhere! You'll definitely make a healthy profit reselling this cool gadget in your physical or online store, so add to cart right away before stock runs out! Another innovative electronic device brought to you by the leader in wholesale electronics from China, Chinavasion. Does this radio receive AM? Nope. Why? Because if you have DAB+ reception you will never listen to AM again! How do I switch between FM/DAB/MP3 modes? Just press the power button. This product is fantastic for those who want to have in the same device, fm radio and mp3, and of course, o good speaker. In the mp3 function, you can move quickly through the folders.